Discussion in 'General Chatter' started by Jo, Sep 9, 2006. Well that got your attention didn't it!!!!??? because i couldn't get on here!!! Came home to connect it and the instructions said to remove old hardware, how the hell are you meant to do that when the cursor wont move?? Haaaaaa that made me laugh! My first reaction was............What is it with her and daddy long legs & now mice!! Now I am going to ask you get banned as you are giving us a bad name............. we have blokes on here now and they are simply going to rip the piss out of you!!! U know there's no sport when it this easy. Jo I am as daft as they come!! I do my own head in at times LOL!! ablaze lucky mum of one of each! 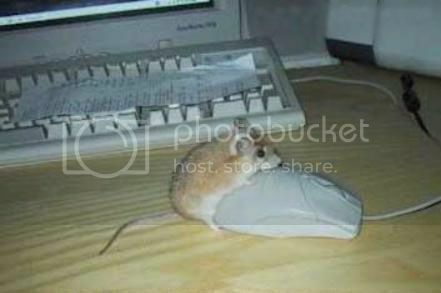 lol i thot u meant a real mouse!! Tip though eithe get rechargable batteries & recharge every night you go to bed or buy a cheaper wired mouse for spares! SO annoying when your mouse dies & you have no batteries in the house! 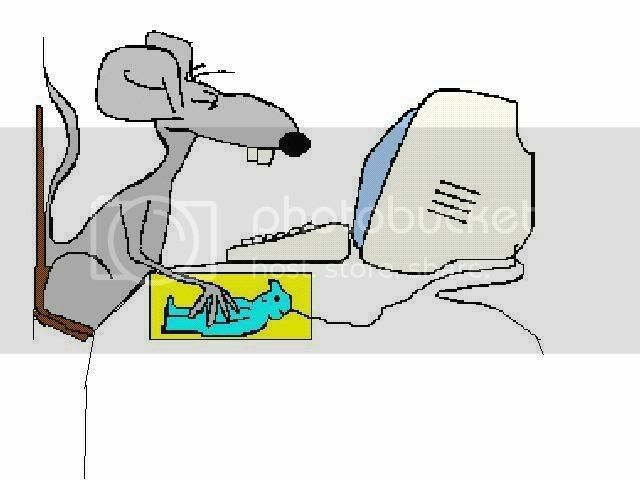 PMSL I thought it was a real mouce too I was gonna say Awwwwwwwww I love mice but now im just PMSL how did u get the batterie sin the wrong way ?? anywa gald you susse dit out and are back online I didnt have a keyboard once cos was showered with coke and then didnt work Hmmm anyway thats life, ho hum. Wobbles, trust you to know abot rechargable batteries, need them a lot do you? My excuse is that i had Jack climbing all over me, does that work? do you beleive me?